A Top Bank Just Downgraded AmEx Stock: Is It Time to Sell? Bank of America Merrill Lynch says investor fear and uncertainty could kill enthusiasm for the credit card giant. It wasn't a happy way to send a big company into the new year. Bank of America Merrill Lynch cut its recommendation on American Express (NYSE:AXP) stock, changing its view on the big credit card company from buy to neutral. That compounded AmEx's misery, as the stock had already taken a hit due to overall market volatility. But perhaps this is deserved, as was Merrill's sudden lack of optimism. Let's explore that, and see if we can determine if all this makes AmEx stock more unattractive than neutral -- perhaps it's even a sell now. In his note to investors, Merrill analyst Kenneth Bruce expressed concern that because of "broader market volatility and elevated uncertainty relating to the macro backdrop, we anticipate weaker sentiment for AmEx shares prospectively." Stock market volatility and macro uncertainty are related, of course. We're going through a period of economic insecurity, with trade wars burning in the background and a haphazard American economic policy. This makes investors nervous, and when investors are nervous, they take it out on the stock exchange. Compounding this, stocks of banks and companies involved in the credit card space (frequently one and the same), are considered by many to be on the front line of an economy. When business is humming, people tend to borrow more money and pay it back relatively fast. When volatility hits, spending often gets curtailed -- and quickly. So, to me, Merrill's unhappy note was a little more gasoline on the fire of investor worry. But I don't think this stock is about to erupt in flames. Here's why. As stock investors, we should absolutely and always monitor the state of the broader economy. This is especially true if we hold shares of banks and other lenders, which are susceptible to its movements. I feel that American Express, though, is exceptional. A major element that gives the AmEx brand its power is the relative affluence of its clientele. Because of this affluence, these folks tend to be somewhat insulated from macroeconomic winds. Recent AmEx numbers bear this out. In each of the three reported quarters of fiscal 2018, the company delivered strong growth on both the top and bottom lines. In all three instances, earnings rose at a double-digit clip, most recently by 22% on a year-over-year basis. This isn't an anomaly, but rather a clear and direct result of the company's efforts. Worldwide billed business (i.e., total transaction volume) rose by 10% in the third quarter, while card member loans zoomed 14% higher. Driven by a 7% rise in the crucial U.S. market, the number of cards in circulation went up to over 115 million, indicating that plenty of people still hunger to be AmEx members. And it's not only new cardholders who are driving growth. With its vaunted and always-competitive Membership Rewards program, the company is doing a fine job of squeezing more customers out of its longer-term clients -- roughly 60% of loan growth in Q3 came from existing card members. Following AmEx's December price swoon, its shares trade at a P/E of 23. This might sound a bit rich to some, but it's actually fairly modest given the bullish expectations many analysts still have for the company's profitability. 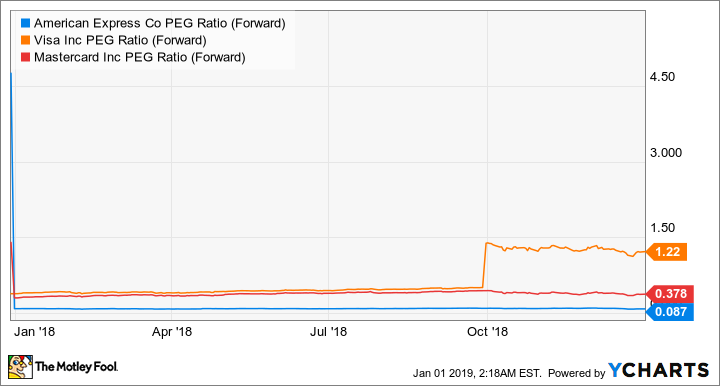 A glance at the forward PEG ratio, particularly when placed next to mighty peer card network operators Visa (NYSE:V) and Mastercard (NYSE:MA), shows that the stock has plenty of room to run. AXP PEG ratio (forward) data by YCharts. Visa and Mastercard are powerful competitors, and the market has been excited about their prospects for years. One reason why is that both are open-loop operators, essentially middlemen between the credit card issuers and the clients (AmEx, by contrast, is a closed-loop company that acts as both a card network and issuer). Volume is key for open-loopers since they're essentially middlemen. Happily for them, the world is accelerating its switch to payment cards from cash, benefiting them enormously. AmEx, since it has to do the grunt work of finding new card members and encouraging them to spend, grows more slowly. But its recent results are very encouraging, and with a business based on relatively well-heeled clientele, it has a built-in defense against economic volatility. I don't think AmEx is a sell at all these days, or even deserving of Merrill's new neutral recommendation. In fact, I'd say it's a bit of a sleeper in its peer group, a strong and well-run business that still has a lot of potential. Investors should, therefore, consider buying it instead.